M & B cropped up a couple of times in the last few days. First because it’s their 100th birthday this year, which isn’t bad going. Then I read a piece about using pulped romances to build motorways. Is it children’s literature, though? Well, it was considered as such when I was at university, reading Literature. (You know these foreigners. They do have weird ideas.) My course had a small section in its children’s literature bit that had us read a Mills & Boon type book, on the grounds that many readers of these books are very young. Having a mis-spent childhood with Barbara Cartland (serialised in a weekly magazine), I could only agree. I wouldn’t put one into the hands of a child, though, even if Daughter did once come home with one found in her classroom in junior school. (A mistake, they said.) Some are very bad, but some are actually not that dreadful. And it can be reassuring to know what you’re going to get. This subject matter is rather yucky. Very, very yucky, really, if you think about it. Before I read Sara’s Face when it was first out, I emailed Melvin Burgess to see if he wanted to reassure me that it wasn’t going to be too disgusting. No, he didn’t. He more or less said that it was going to be horrendous. Ah well. I read it anyway, and it wasn’t too bad. I mean, it’s a good story, as you’d expect from Melvin. But it’s got a high yuck-factor. Daughter snatched it off me, naturally, and we ended up reading it in tandem, with two bookmarks. It was another of those books where Daughter simply doesn’t want to take part in ordinary life until the book’s done. Sara’s Face is out in paperback this week, and if you’re looking for something that little bit extra, then go to the Spinebreakers website to watch the video logs they’ve recorded, based on the ones Sara records in the book. The book originally came out just after the first real face transplant, but it was written before that took place. Melvin was obviously feeling the right vibes. Sara is being used and manipulated by rock star Jonathon Heat, who is after Sara’s face, to replace his own mutilated face. In usual Melvin style the story is told by several people, each one casting a different light on what goes on. It is pretty gruesome, but the worst of it almost vanishes with the reader’s dislike for Sara’s willingness to put up with it all. There are many twists and turns, and you’re never entirely sure what to believe. If you’re not sqeamish – read it. If you are, consider carefully if you dare. 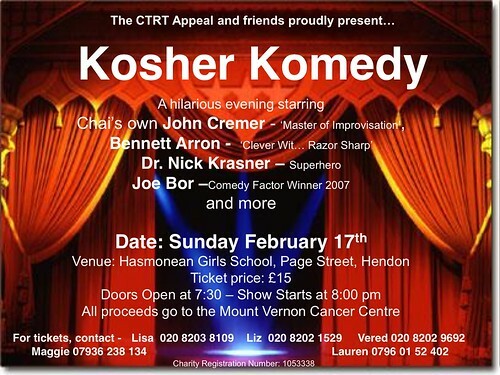 Some friends of Dina’s are organising an event in London on the 17th February, to help reach Dina’s target of £100,000. Information on the flyer below. Do try and go if you can. It sounds fun. And let me know what it was like. Please. How much influence did she have, the Retired Children’s Librarian? Hmm. Well, she was an adult who read children’s books for a living. And as a family friend she provided me with reading material throughout my childhood. Good books for Christmases and birthdays, and the occasional book left behind after a visit. She also had the good sense to give me LPs once I got to my mid-teens, so she knew when to give up, and it wasn’t even as though I had stopped being a reader. She, too, was heavily into crime. Still is, now that retirement means she doesn’t have to keep up with all the trends in children’s books. She would come and stay for her holidays, well equipped with crime fiction for the duration. And then she’d leave some behind for me. I used to think it was her being generous. Now I’m beginning to wonder if it was a sneaky plot to get me reading certain books? I particularly remember Craig Rice. Very funny. The shoe is on the other foot now. I was so enthusiastic about Harry Potter nine years ago, that she bought the first book when it had been translated. I believe she read half of it before chucking it across the room in disgust. And can I get the woman to try Philip Pullman? No, I can’t. Knowing that the Retired Children’s Librarian is not keen on fantasy, I invested in Sally Lockhart and I Was A Rat. Not wanting to do things by half measures, I got them personally signed by Philip. She still doesn’t read them! Sally Lockhart is crime, and everything she likes in a book. Why?? Never mind. The Retired Children’s Librarian has an excellent memory, and it’s still possible to ask detailed questions about books and she’ll remember. I will have forgotten it by next week. So, I wonder if it’s coincidence or influence that I’m a children’s books and crime fanatic, too? What’s more, as I was thinking about books to recommend to less enthusiastic young readers recently, I suddenly remembered, that about thirty years ago the Retired Children’s Librarian wrote a book about that very subject. Coincidence, again. Just wish I could get her onto the internet. Anything to stop her watching more Midsomer Murders. Suitable for adults as well? It’s perfectly natural to read children’s books. They are not less sophisticated, but rather the opposite. Once an author has removed the adult material there might not be all that much left. So to fill a children’s book satisfactorily without the grown-up stuff must make for a better book. It’s been good to follow Peter from Detectives Beyond Borders in discovering Artemis Fowl. Peter may well have been one of those adults who wouldn’t expect to find adult pleasure in a children’s book. Now that he’s got going with Artemis, his enthusiasm knows no bounds, almost to the extent that there’s a feeling Eoin Colfer is wasted on the young. I believe Eoin himself was wrong when he assumed that Artemis fans would move on by the age of 14. Similarly, the Guardian reviewer of Airman felt this book was for older readers. The difference might be more one of personality, than age. Peter reckons Half Moon Investigations is so mature that there’s a risk things will go over the heads of young readers. But I think it’s good with layers, where all readers get something, but not necessarily the same thing. I recently read the short story Taking On PJ which Eoin wrote for an adult anthology called Dublin Noir. Very different and very good, and still Eoin Colfer. Books are obviously not wasted on young readers, but it can be a shame that the adults don’t discover them. For instance, What I Was got shortlisted for the children’s Costa prize, whereas in the US it wasn’t published as a children’s book at all. Whatever that may prove, it shows the boundaries aren’t all that set. The witch has been looking at lists. Sounds a bit boring, but every now and then it’s fun to have quick glance at what’s what. Simply Books must have had a guilty conscience the other day, because they showered me with slightly out of date bookselling magazines. Anyway, one from a week ago was bestselling Swedish fiction, which caught my eye, for some reason. I don’t know everything. No, really, I don’t. But, out of the ten books, I know for certain that five are crime. Could be more. 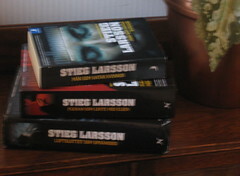 But this goes to show that Swedes in and out of Sweden have read Stieg Larsson, so could explain why he’s at the top of the selling lists. We went to see The Golden Compass again, the other day. The Resident IT Consultant hadn’t seen it first time round, so we indulged him. To tell the truth, it was Son’s birthday, and the dratted boy had asked loads of friends to visit him in Edinburgh, but we weren’t invited. Hah. Not that we’d have gone, but it would have been a nice gesture on his part to pretend the boring old people are worth having around. Now I want to be Eva Green even more than last time. Please tell me I can be Serafina Pekkala. The rest of the film stood up well to a second viewing, I thought. After GC we polished off a couple of take-out pizzas. At least I didn’t have the same amount of cleaning up afterwards, as I usually would on that day every year. It brings back fond memories, as one year a few years ago Son’s nicest, bestest behaved and well brought up friend called me a witch. He did it by mistake, the poor boy, but it was fun.